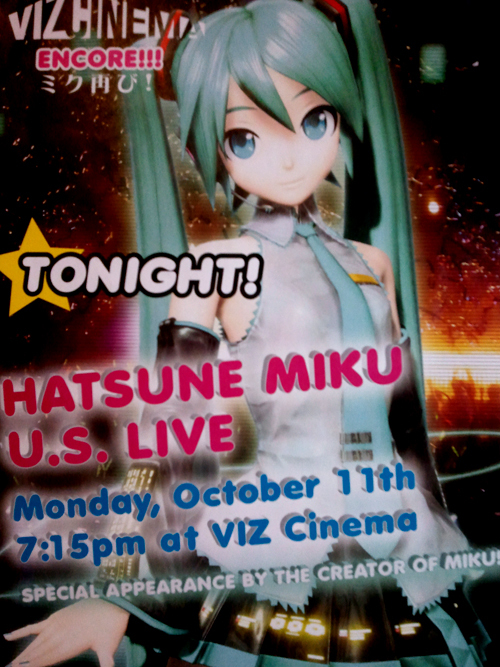 As some of you may recall, Miku had her first ‘Live Concert’ in the US back in September. We, unfortunately, weren’t able to be present at the event. We did manage to attend this event. The CEO of Crypton Future Media, Inc., Hiroyuki Itoh, was the aforementioned “creator of Miku” and was present at the beginning of the encore concert to give a presentation about what Vocaloids were and how they’ve evolved. The presentation, to the best of my knowledge, is about the same as the one that was presented at the New York Comic Con/Anime Festival. Prior to Mr. Itoh’s presentation, there was a short lead-in by the editor-in-chief of Tokyo Kawaii Magazine (an iPod/iPhone e-magazine), Toshihiro Fukuoka, during which he talked briefly about their upcoming, Hatsune Miku-centric, November issue. While there was nothing altogether new in Mr. Itoh’s presentation, it was still a bit interesting to listen to. There was more mention of a possible English-speaking Hatsune Miku, as well as a US Vocaloid store. Special guest speakers aside, there was also limited-run merchandise available at the concert, including the very difficult to obtain, life-size Project DIVA 2nd wall tapestries that were only available from Comiket 78 earlier this year. Other merchandise included $100 blu-rays (yes, one hundred dollars, though you got a free poster with it) and Hatsune Miku mugs. At the end of the concert, there were also a few limited-run magazines (only 2000 were printed, apparently) raffled out, as well as sets of Project DIVA stickers. The event concluded with an autograph session from Hiroyuki Itoh, which was unexpected and fairly neat. All in all, it was a fairly entertaining evening (especially when some of the younger audience members got up to dance to Popipo–it was horrifyingly cute), even though the ‘concert’ was nothing more than a live-screening of the 39’s Giving Day blu-ray. We weren’t really expecting much more than that, in any case. note: there is no recording of the concert itself, as it’s nothing more than the blu-ray, which most folks can purchase online. Oh wow, from NYC to SF just like that, huh? I saw the “concert” at New York Anime Festival on Saturday, the 9th, got to meet Itou afterwards. Too many people milling around to get an autograph, but I did get a photo with him, which was awesome. Unfortunately, not being able to speak Japanese, I couldn’t talk with him. But very nice guy and friendly. Was very welcoming of all the fans and photos, even though that wasn’t part of the event. And despite being just a screening, the fans definitely made the “concert” a rocking experience. I suppose the reason they did an autograph session afterwards was because of the marginally smaller crowd at the encore event.